With Toon, you are in charge of your home. Toon gives you insight into your energy consumption, so you can start saving. And with the free Toon-app, you control your heating, lighting, smoke detectors and smart plugs on the go. With Toon’s thermostat function, you can count on a warm welcome home. You can set the temperature manually or use Toon’s smart functions. With Toon’s four states – Away, Home, Comfort and Sleep – you can create a schedule, based on your own weekly routine. Want to feel snug when watching Netflix? Program Comfort in the evening. Ready to save energy while your sleeping? Set Sleep at a low temperature and program it for nighttime. You decide. Toon checks your energy and natural gas usage every five minutes. This way, you’ll know exactly how much you consume every day, week or month. By using smart plugs, you’ll even know which appliances consume the most energy. You can also compare your own energy consumption with that of your friends. 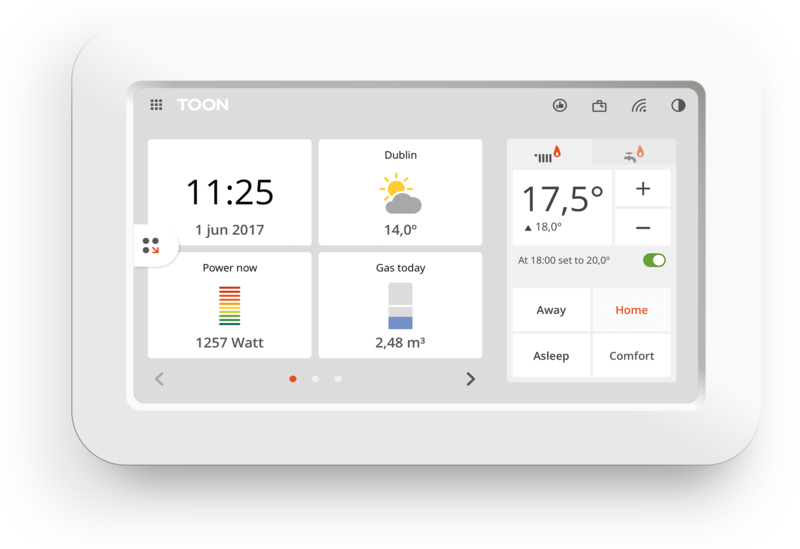 Toon helps you make your home energy self-sufficient. If you have solar panels on your roof, Toon will measure their generated energy every five minutes – and keep you in the loop. Toon functions as a smart hub as well. Add a little ambiance to your home by controlling Philips Hue lighting. Want to get insight into individual appliances? Use Fibaro smart plugs. And if you want Toon to watch over your home, even when you’re away, use Fibaro smoke detectors. This way, you’ll receive an alert at home or on your smartphone when there’s a fire. Let’s join forces. We challenge you to explore the countless possibilities of the ToonAPI. Together, we can create a smarter, easier and more comfortable living environment for people everywhere – both today and tomorrow. Not sure where to start? Check out the developer journey for an overview of all the steps.